I’ve just finished teaching a mini-course called “Let Your Inner Artist Out.” I so enjoy teaching these courses. It’s very rewarding to me to be able to help aspiring artists to express themselves in paint. People very often know what they want to say, but don’t know how to make their vision come out on the canvas. With just a few pointers on how to tweak their composition, use color effectively, and an exploration of the some of the many mediums available to the artist, I can help my students turn an amateurish painting into something that gives them a lot of satisfaction. So much fun! And as an added bonus, I get re-inspired myself. Happens every time. 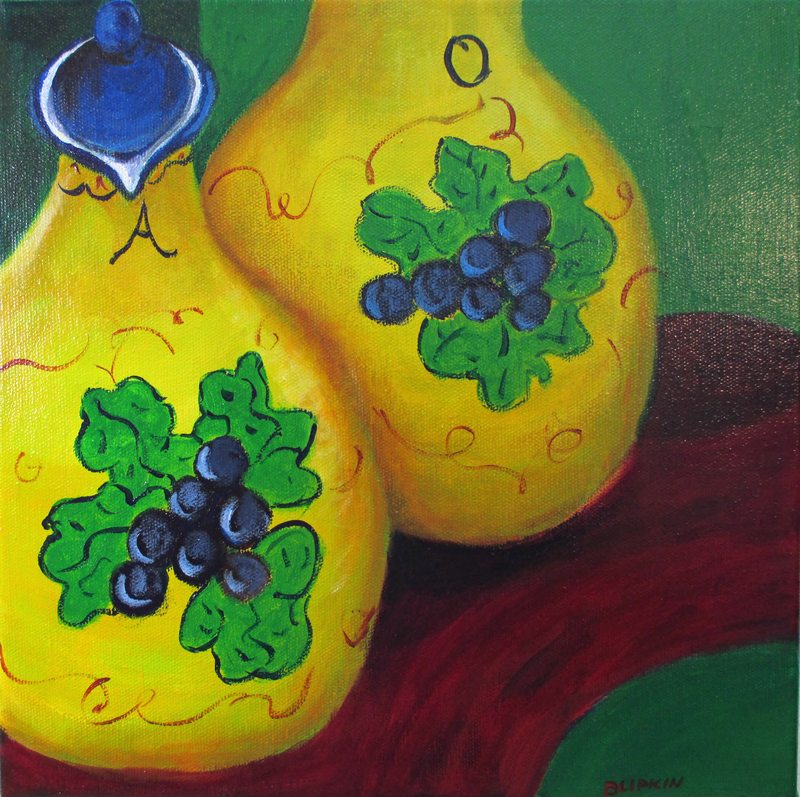 I’m excited to announce that prints of my paintings can now be purchased at www.FineArtamerica.com. They come in various sizes, printed on various materials such as paper and canvas, available both unframed and framed. They are very affordable, and offer a good way to collect my works at a reasonable cost. Isn’t this a lovely red flower? I saw it while walking through my neighborhood last spring, and it called out to me to paint it. Simple framed in white, ready to hang. Sometimes framing a painting makes all the difference in the world. I like to use very simple floater frames, which let all of the painting present itself. 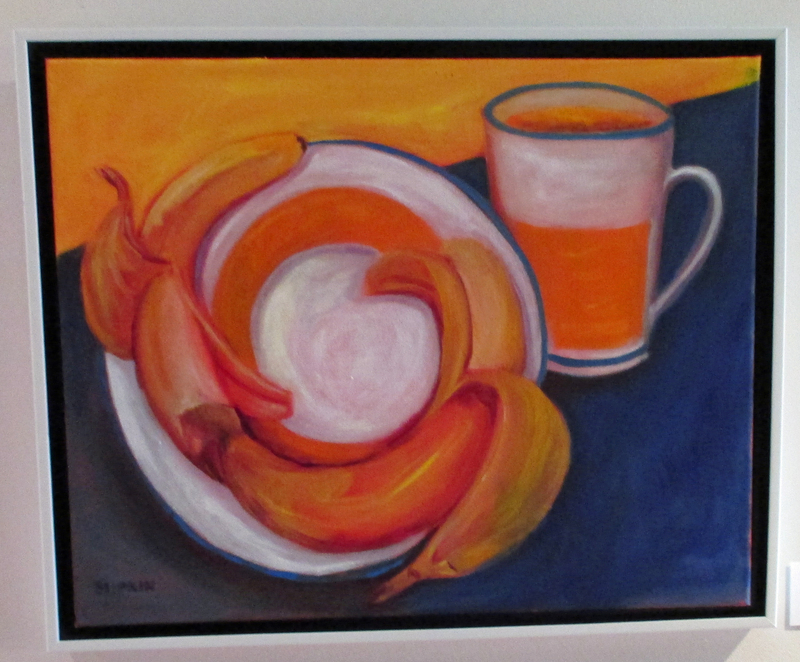 This one, titled “Bananas”, is ready to hang, and the simple white frame complements any decor. Oil, 16 x 20, framed in simple white floater frame. In applying paint to canvas, there are two separate basic issues: value and color. (There are other issues, too. This is the short course.) Value is how light or dark something is in relation to any point on your canvas, or in your subject. A painting can be created using only different values of gray, which is a good way to concentrate on accuracy of form and perspective, without having to also worry about color. The Old Masters originally always painted a grisaille study first. When they were satisfied with their results, they added thin layers of color, glazing, to complete the painting. The grisaille showed through, so the values were automatically correct. This is a very slow method of painting, because the grisaille, and then each layer of color, must be completely dry before proceeding. But it’s a really good exercise to learn how colors work together. If you learn some color basics, you will be better able to make informed decisions about color in your paintings. Primary colors: red, yellow, blue. All other colors are derived from these three colors. Secondary colors: orange, green, purple. These are derived by mixing any two of the primary colors together. (Mixing all three primary colors together results in a muddy gray.) For example, red + yellow = orange; yellow + blue = green; blue + red = purple. Tints: adding white to any color will make a tint of that color. Shades: adding black to any color will make a shade. You should have a color wheel to look at as you read these explanations. Complementary colors: Those opposite each other on the color wheel. Example: red/green; blue/orange; purple/yellow. Analogous colors: Those next to each other on the color wheel. Analogous colors calm each other down; so placing a blue stroke next to a green stroke makes an area seem calmer. Mixing analogous colors changes the hue, but doesn’t make a gray. Mixing purple and red makes a redder purple or a purpler red, depending on how much red or purple you use. Mixing blue and green makes a bluer green or a greener blue, again depending on how much of each color you use. 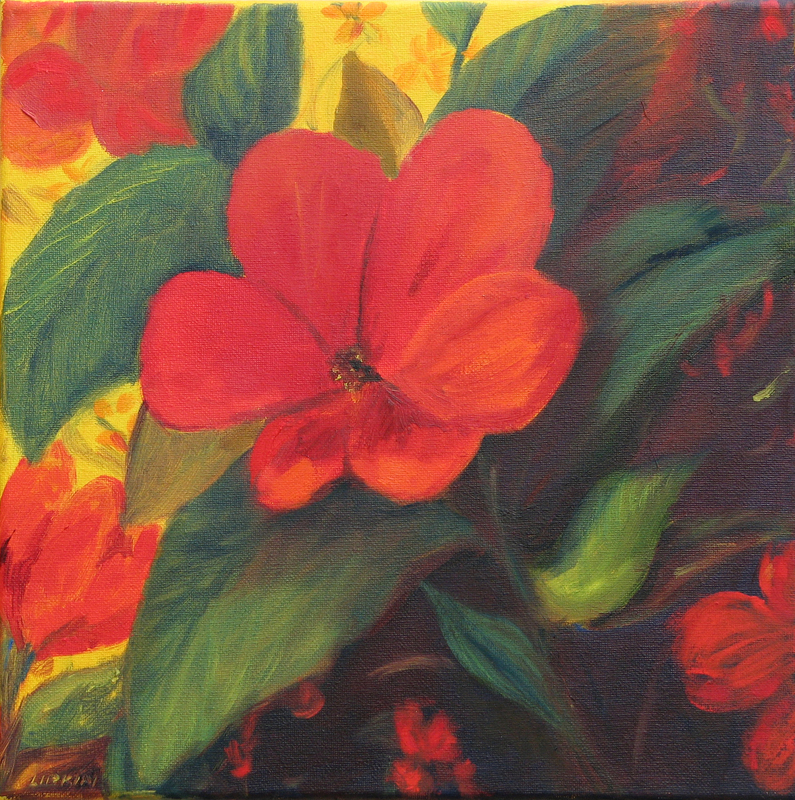 A painting which uses a lot of complements will seem quite lively, especially if you use saturated colors. (Again, this gets us into temperature. As you can see, this is a large subject. Let’s stick with the basics for now.) 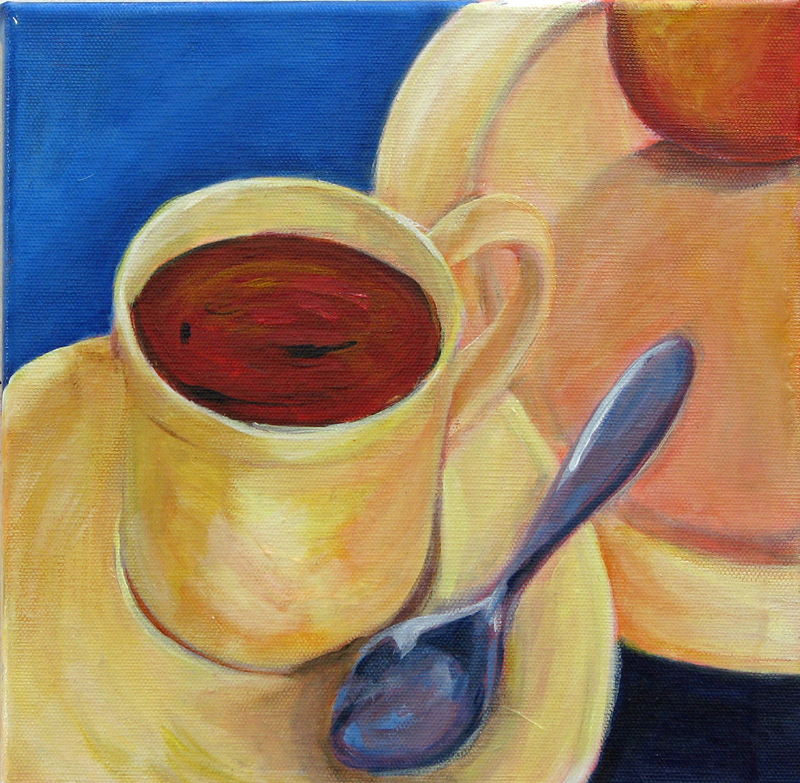 A painting which uses lots of analogous colors will seem calm and serene. The best way to learn about color is to experiment with your paints. Your basic supply should include a warm red and a cool red (cadmium red, alizarin crimson); a warm blue and a cool blue (cobalt, ultramarine); and a warm yellow and a cool yellow (cadmium yellow, winsor lemon). These are only suggestions. You can chose other specific shades. You also need a basic white. Titanium white is most opaque. Zinc white is more transparent and better for mixing, or you can also buy a mixing white. You need a black in your palette, but use it very sparingly, as a little goes a very long way. A word about gray. Black and white make gray, but you can also make gray by mixing complementary colors, and these are much more satisfactory. They are richer and more interesting, and have more subtle effects. However, black and white grays are fine for your gray (grisaille) painting. This is just a brief overview of a very large subject, which basically requires a lifetime of study. But it should be enough to get you started. Happy painting! I’ve been working away as much as I can. I’m really enjoying my new Still Life series, which are small paintings, focusing very close up on ordinary objects and food items. Today, I varnished my latest 3 paintings, which are all available on http://www.dailypainters.com. Here’s Vinegar & Oil, acrylic, 12 x 12. Click on it to purchase instantly through PayPal. I’ll ship it out right away, or any others you like.